Since June, we have been reporting on the exciting rollout and results of this year’s prestigious James Dyson Awards 2016. From vaccine cooling systems to contact lenses that measure glucose levels: these 20 inventions were proclaimed the regional award winners. 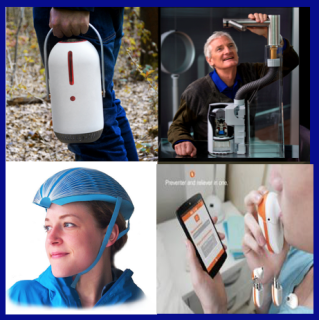 This year’s James Dyson Award received almost 1,000 entries that are both problem solving and pioneering. On September 16, we announced the American winner – Isis Shiffer and her design submission, the ‘EcoHelmet.’ Today we are pleased to announce the winners from 19 additional submissions. James Dyson, who will pick the international winner and two runners up, will now review these projects. The international winner of the Grand Prize, which will be announced on October 27, 2016 will be awarded $75,000 to help further develop their invention. Problem: Asthma is the inflammation of the airways when exposed to environmental triggers or stress. It is often confusing, while suffering from mind clouding symptoms such as shortness of breath and panic, to know which medication to use and when to take it. Approximately 250,000 people die prematurely each year from asthma and almost all of these deaths are avoidable. Asthma is a silent disease and a silent pandemic. Solution: Respia is an asthma management system that tracks and records the user’s respiratory health and medication use. It is the complete redesign of existing aerosol inhalers coupled with a world first wearable patch that tracks respiratory health. Problem: Blind and visually handicapped people cannot use a tablet. Solution: BLITAB® is the first-ever Braille tablet, using an innovative liquid-based technology to create tactile relief, which outputs braille, graphics and maps for blind and partially sighted users. BLITAB® converts any document into Braille text. You can plug a USB flash drive or connect to Wi-Fi. The tablet surface raises little smart tactile dots from the surface, which they call “tixels” (from “tactile pixels”). Users can read a full page of text at a time but also listen to the text-to-speech voice. Problem: Microwave use is extensive in China, but cooking with a microwave is unhealthy. Solution: Microwave Steamer can convert any microwave into a steamer. An inner metal layer means that only water can be heated by the microwave and the water will cook the food with a smooth temperature below 302°F, protecting the nutrients. Problem: It is estimated that 70% of full-term new-borns and 90% of preterm infants suffer from neonatal jaundice, which is defined by an increased level of unconjugated bilirubin in neonate’s blood. The most effective and simple way to reduce bilirubin level is the blue light therapy. However, the glowing of blue light lamps gives unpleasant side effects to the nursing personnel. Solution: SvetTex Nest is a textile phototherapy system for jaundice management that embeds light therapy inside the positioning device for premature or full-term babies. In contrast to current technologies, SvetTex Nest has the biggest irradiating surface, meaning the entire baby is bathed in light—providing more effective therapy. At the same time, the non-luminous outer surface of the nest protects the eyes of the baby and the nurses. Problem: H-FLO is a safety device developed in light of a tragedy in Limerick, Ireland. In August 2015, two men were carrying out maintenance work on the Thomond Bridge over the River Shannon. The men were harnessed into an elevated work platform when the cable that held the platform up failed. The men were pulled down to the bottom of the river and were unable to detach themselves from the platform. As a result, they sadly drowned. Solution: H-FLO uses technology currently employed in automatic inflatable life jackets. The inner workings of H-FLO are protected by a stainless cylinder; at either end of this cylinder are semi-circular bars that the harness and the lanyard connect to. It’s a device composed of two segments that separate when under water. The design uses male and female shafts coupled together with a pin. When H-FLO is submerged in water a gas canister is pierced and the gas is directed at high pressure on to the face of a pin. This drives the pin from the coupled connection, allowing the two sides to separate, and enabling the user to get to safety. Disengagement from the harness is triggered in less than five seconds. Problem: Patients who require kidney dialysis need to undergo surgery. Solution: Stent Tek is a minimally invasive medical device that aims to make it safer, easier and cheaper for the 2.5 million patients worldwide with kidney failure to receive dialysis. Stent Tek eliminates the need to undergo surgery, reducing the $45 billion yearly cost of treatment. Problem: The measuring of blood glucose levels in diabetes’ sufferers is invasive. It requires drawing blood or puncturing the skin, which often leads to low compliance rates. Solution: Smart Contact Lens Platform continuously and non-invasively monitors glucose levels in tear film. It sends the information to a mobile phone so patients can better manage their diabetes. Problem: Current vaccine programs in developing countries don’t meet the international standards for temperature safe vaccine distribution, which leads to vaccine freezing and losing potency. Solution: Isobar is a system for maintaining stable temperature control while transporting vaccines. The core principal of Isobar is long-term, controlled cooling effect that is rechargeable anywhere in the world. 2-phase ammonia-water absorption refrigeration invented by Einstein in 1906 is fundamentally the simplest and most powerful cooling technology for its size. It relies upon heat to separate the ammonia into an upper chamber. Ammonia is hydroscopic, meaning it is naturally drawn to water. When a valve opens, Ammonia evaporates into the original chamber and gives a powerful cooling effect. Problem: The honeybee population, which is the third most important animal after cows and pigs in terms of food production, is in steady decline. Solution: Bee2Bee is a mobile, lightweight and quick-to-assemble culture system for bees. It supports the care of bee colonies without the need to disturb the colony. Problem: Mastitis, the inflammation of the mammary gland and udder tissue, is one of the most frequently occurring diseases in dairy cows and can ultimately lead to the death of the animal. In the current system, the milk of identified cows is examined in laboratories, a process which takes at least two days. Prior to the results of the analysis, the cow receives a treatment with antibiotics to increase the chance of recovery. Solution: Mamelle accelerates the diagnosis of mastitis (inflammation of the mammary gland and udder tissue) in dairy cows from a couple of days to a few seconds: helping to optimize and to reduce the use of antibiotics. Problem: The design of metered dose inhalers has not changed in 40 years. While effective, they are incredibly inconvenient to carry. Every diagnosed asthmatic is prescribed one, and is advised to keep it on them in the event of emergency. Solution: Bloom is a credit-card sized inhaler. It holds 6 doses of relief medication, and is refillable from the prescription inhaler canister. The nozzle of the inhaler is inserted into the refilling valve, creating a hermetic seal. With each pump of the inhaler, one dose is transferred and stored into Bloom for use at a later time. When the user feels an asthma attack coming on, they can use Bloom like an ordinary inhaler: one press of the trigger administers one precise dose of medication deep into the lungs. Problem: It’s difficult for the elderly to go out on their own because of risks such as falling down or getting lost. The elderly also tend to think negatively about going out as their physical abilities decline with age. Solution: Communication Stick is a walking cane that connects care workers and the elderly at nursing homes. Its functions are: converting speech to text messages, reading out received text messages and sending location information when a fall is sensed. These functions support safety for the elderly, allowing them more independence. Problem: When cyclists have to navigate through the city they encounter many problems. For example, using Google maps forces them to pull out their phone constantly or listen to a nagging voice in their ear. Solution: Haize is a Bluetooth-enabled compass for cyclists that uses phone GPS and Bluetooth to point to the final destination, providing easily readable information that the cyclist can interpret on the go. Problem: Out of the 16 million motor vehicle accidents that occur annually in the United States of America, 850,000 of them are related to blind zones. Solution: Blind zone areas can be eliminated by properly adjusting rear mirrors in a vehicle. The Intelligent View System (IVS) is an easily installed hardware that employs automated adjustment of the rear mirrors relative to the head position of the motorist. Problem: There is no easily accessible, tangible interface that allows people to animate in 3D. Solution: Kodama is a tangible interface for creating 3D animations by moving toys with your hands. This can be used to allow children to create their own stories—or as a rapid storyboarding tool for animators. Problem: Current artificial sea defence structures tend to be dislodged over time by the force of the ocean constantly crashing against them. Solution: TetraPOT is a sea defence system. Hollow, concrete blocks are filled with mangrove seeds and distributed along coastlines, where the interlock. Over time, this creates a long-lasting sea defence of growing trees and roots that help keep the blocks in place. The roots will intertwine and gradually become a natural sea defence themselves. Problem: Mosquitoes carry diseases, but existing solutions focus on killing the insects. Many people don’t understand the damage this does to the ecosystem. Solution: Moka is an urban system that deals with tiger mosquitoes and associated disease transmission risks. Without harming the insects, Moka will attract them, feed them and cure them: dealing with the issues without impacting the ecosystem. Problem: Traditional kitchenware can be difficult for those with only one arm to use. Solution: Oneware is a sink tool that is designed specifically for those who only have one functioning arm. It’s a series of modular units that aids them in various kitchen processes, from food preparation to dish washing. Problem: The World Health Organisation reports that drowning is the third leading cause of unintentional injury or death—ending over 370,000 lives every year. Solution: AQUILA is a public service design to assist lifeguards on the beaches. By applying a self-inflated platform and AED on the drone carrier, it reduces the time spent on the rescue process. Problem: Around the world, bike share programs are giving commuters and tourists a convenient, inexpensive way to move from point A to point B. But bike share users very rarely wear helmet. Few people want to carry a helmet around all day, and rental helmets can be unsanitary or ill-fitting. In busy cities, crashes do occur, and wearing a helmet can reduce the chance of injury or death by 85%. Solution: EcoHelmet is a folding, recyclable helmet for bike share systems. Made of waterproofed paper in a unique radial honeycomb pattern, EcoHelmet allows cyclists to ride more confidently, and more safely.